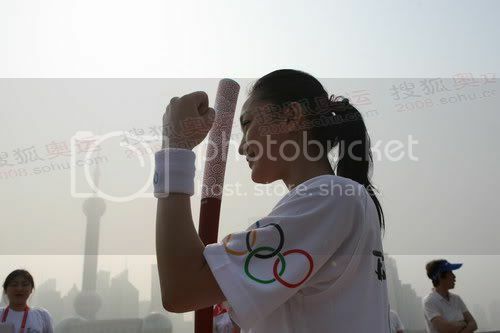 May 23rd 2008, Olympic torch begins its journey in Shanghai at north square of Shanghai museum. 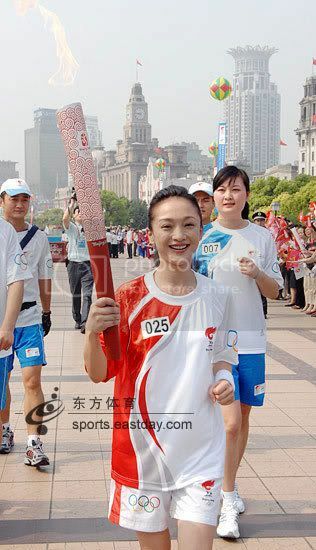 Zhou Xun is the first person holding torch this morning. 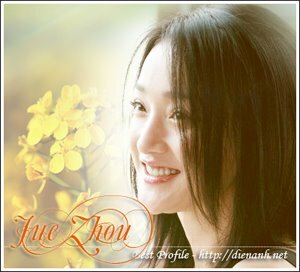 Here the short interview after Zhou Xun finished her running. Reporter: We have just seen you holding Olympic torch, how do you feel now? Reporter: Stars like you attended may big activities, but today your appearance seems very simple. This is the most dissimilar time for you? Zhou Xun: In fact, such simple clothes I wore, but I think this is really special moment because I rarely have chance to wear sport clothes, and also this is the first time Olympic Games held in China. Reporter: You played many roles in movies, is there any difference between running over 100 meters today and your former performance? Zhou Xun: This activity is not acting. This is Chinese people's pride. Reporter: We all pay attention to earthquake area. You are a warm-hearted star. Do you have any plan to join charity or welfare activities? Zhou Xun: I think all of us will do this because making good the damage is not short-term issue which cannot be solved in several months, 1 or 2 years. It may take Chinese 56, 78 years. I will always do my part.